Tip: The node reboots itself upon completing the update installation, so it may be preferable to schedule an installation time. 1. From the parent node, go to System > Central management > Overview. 2. Locate and select the nodes that require updating. To select all nodes, select the checkbox in the header row. 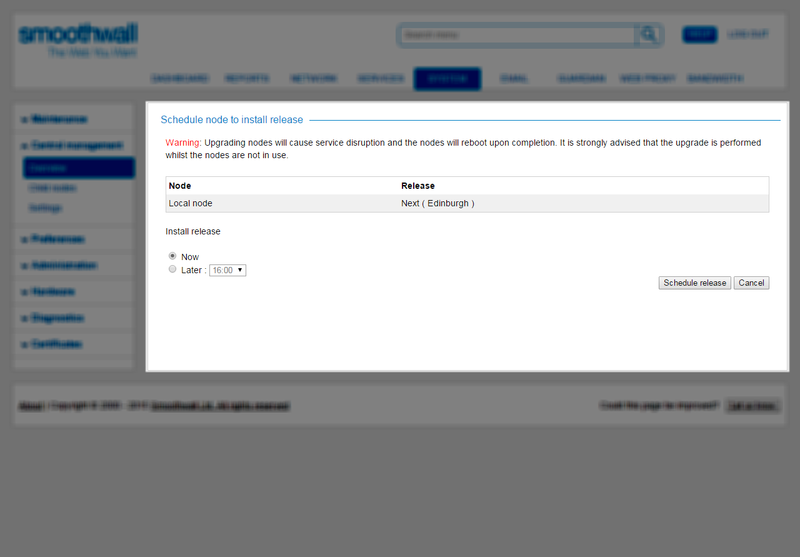 You are taken to the Schedule node overview page. • Now — Select to apply the release immediately. • Later — From the drop-down list, choose a convenient time within the next 24 hour period to install the new release, and reboot the nodes. • Now — Select to apply the update immediately. • Later — From the drop-down list, choose a convenient time within the next 24 hour period to install and reboot the nodes. 1. Go to System > Central management > Overview. You are taken to the Clear node schedule page. 3. Click Clear schedule to clear the updates.